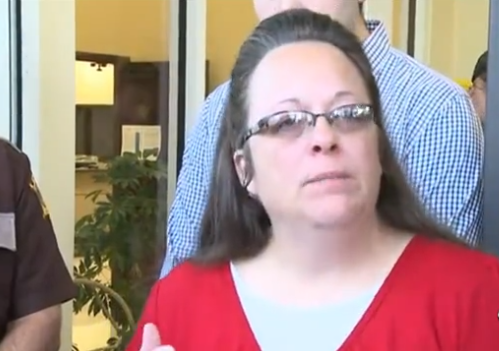 MOREHEAD, Ky. — An attorney for Kentucky clerk Kim Davis state that they believe that the American Civil Liberties Union (ACLU) wants “her scalp to hang on the wall” after the organization filed a motion in court on Monday accusing Davis of interfering with her deputy clerks by altering the marriage licenses to remove her name and other identifying information. As previously reported, when Davis returned to work on Sept. 14, she announced in a press conference that while she would not stop her deputies from issuing the licenses, the documents would not bear her name—as her request from the beginning of the battle was that the licenses bear the name of another authority. She then proceeded to replace the documents with those that do not include Davis’ name, nor the name of any deputy clerk or even the county. They simply require the deputy clerk’s initials with a notarization stamp. “The adulterated marriage licenses received by Rowan County couples will effectively feature a stamp of animus against the LGBT community, signaling that, in Rowan County, the government’s position is that LGBT couples are second-class citizens unworthy of official recognition and authorization of their marriage licenses but for this court’s intervention and order,” it asserted. While the motion does not ask that Davis be sent back to jail, some opine that there is a possibility that it could still occur. The ACLU rather requested that Davis be fined and that another person be assigned marriage license duties in the clerk’s office. Mat Staver, founder of Liberty Counsel, which is representing Davis in court pro bono, said that Davis has done no wrong in removing the identifying information from the licenses, as the documents were allegedly approved by both the governor and the state attorney general’s office. Staver stated that he believes the ACLU rather has a personal vendetta against Davis.